GEO ExPro - The Weald Basin: Hot Spot or Hot Air? 'Simplified Geology of the Wealden Dome' (Based on an illustration by Clem Rutter). There was great excitement in the newsrooms of the UK in mid-April when a small oil and gas company announced that more than 100 Bbo were lying beneath the Weald, south of London in south-east England – over 158 MMbo per square mile. Executives at the company, UK Oil & Gas Investments (UKOG), described this as ‘a possible world-class potential resource’, and suggested that it could create ‘many thousands of jobs’. Most of the assets of UKOG are focused on the Weald area, including the block which contains the Horse Hill-1 well, drilled late last year, the results of which had previously been announced as a rather more modest 8.2 MMb oil in place in the Late Jurassic Upper Portland Sandstone. However, further analysis of the well, which is the first one to be drilled on the licence since the 1960s and went to a much greater depth than tried previously, suggests there may be potential in older Jurassic horizons. Research on the well, undertaken in part by Nutech, a leading petrophysical analysis and reservoir intelligence company, concluded that it discovered 200m aggregate net pay section, primarily within three argillaceous limestones and interbedded mudstones of the Upper Jurassic Kimmeridge, and in the mudstones of the Lower Jurassic Oxford and Lias sections. Additional geochemical and petrophysical analyses are ongoing. 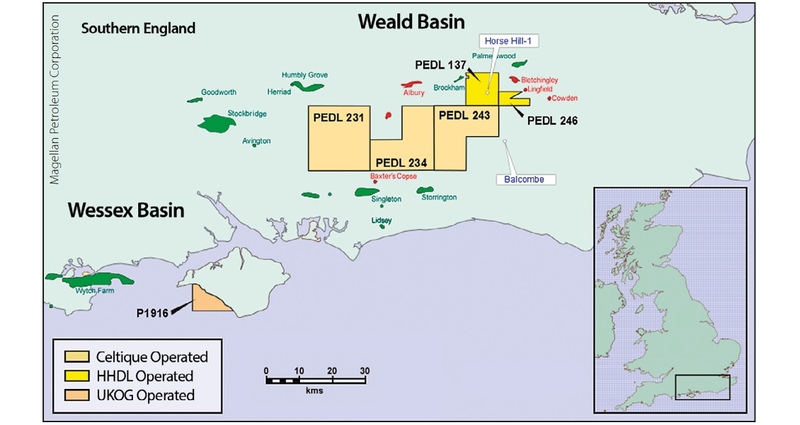 The excitement in the media was brought about because UKOG, which has a 20.358% interest in the licence, extrapolated these finding across much of south-east England, suggesting that the “Horse Hill Upper Jurassic rock sequence is analogous to known oil productive hybrid reservoir sections of the Bakken of the US Williston Basin, the Wolfcamp, Bone Springs, Clearfork, Spraberry, and Dean Formations in the US Permian Basin and the Bazhenov Formation of West Siberia. The US analogues have estimated recovery factors of between 3% and 15% of oil in place”. 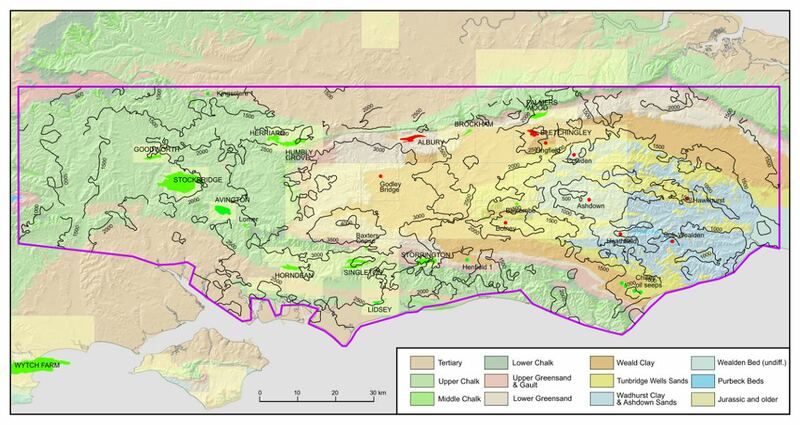 The company believes that the pay thickness plus the naturally fractured limestone make Horse Hill a new ‘hybrid’ play, which could be exploited using conventional horizontal drilling and completion techniques and without the use of hydraulic fracturing. This last point is highly important in an area which has already seen major demonstrations against the possibility of fracking at a drill site at Balcombe, about 50 km to the south. This positive analysis of potential in-place reserves is not, however, in accord with the British Geological Survey, who in May 2014 produced a report in which they estimated the range of shale oil in place across the Weald to be between 2.20 and 8.57 Bbo, with a central estimate of 4.4 Bbo. Meanwhile Magellan Oil, which has a 35% interest in the Horse Hill acreage, was quick to point out that, while encouraged by the technical analysis, further testing and drilling would be needed before they could form an opinion of the prospect’s economics. A number of analysts queried the high estimates, pointing out that there is an implied assumption of limited compartmentalisation, impossible to ascertain from the single well, and that the homogeneity which makes rocks like the Bakken so productive was unlikely to be replicated in the Wealden rocks. Many do not believe that the high level of natural fracturing reportedly seen in the limestone at the wellsite would necessarily be found throughout the area, meaning that the exploitation of any resources without fracking would be difficult. Geological issues aside, the Weald Basin, much of which lies within the wider London commuter belt, is relatively densely populated and contains some of the most expensive real estate in the country. It also includes large areas of protected land, national forests and parks and designated areas of outstanding natural beauty. Opposition to development of this resource will be very strong, costly to surmount and the regulations to ensure protection of the environment are vigorous. The people of Great Britain are unlikely to be relying on this resource to heat their homes and power their cars for some time to come. 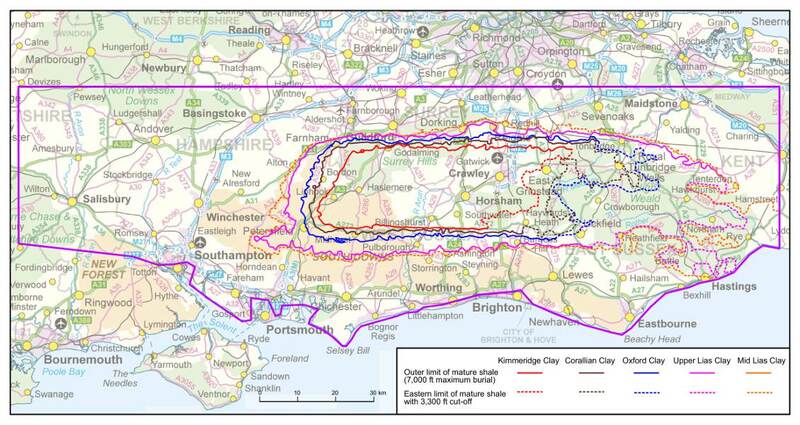 BGS/DECC ‘The Jurassic shales of the Weald Basin: geology and shale oil and shale gas resource estimation’.